The relatively rapid swing away from traditional four-door sedans to sports utility vehicles (SUVs) has caught several car makers napping. Now virtually all of them are rushing to introduce SUV models, even premium and sporty brands are adopting and adapting versatile SUV body styles and features to fit in with their brand values. The original forerunners of the now-common SUVs were four-wheel drive models such as the Toyota Land Cruiser and Prado, many of the Jeep models, the Mitsubishi Pajero, Nissan Patrol, Suzuki Jimny, Land-Rovers, and the like. They were then followed by vehicles based on one-ton bakkies such as the Hilux Surf, Toyota Fortuner, Ford Everest, and Mitsubishi Pajero Sport. Concurrently with the evolution of the body-on-frame SUVs there was another SUV sub-category developing. This was the so-called soft-roader or cross-over, which was heralded by the arrival of the Toyota RAV4 back in 1994 and has subsequently been followed by similar models from most of the world’s volume car makers. However, what has been surprising is how many premium and sporty brands have joined the swing to the SUV. Admittedly we have had the Land-Rover-developed Range Rover since 1970. BMW was one of the early adopters with its X3 and X5 and over the years they have been joined in this now overcrowded market segment by Mercedes-Benz, Audi, Lexus, Infiniti, further Range Rover models, Porsche, Bentley, Lamborghini, Alfa Romeo, Maserati, and upmarket Jeeps. Rolls-Royce is preparing to launch its Cullinan SUV and Ferrari evidently also has an SUV in the pipeline. Even Geely, the new owners of Lotus, the British niche sports car brand, wants its new acquisition to develop an SUV, which could include some Volvo components as the Swedish brand is also found in the Geely stable. The world of off-roaders is certainly no longer holy ground where the specialist car brands have no desire to tread! Porsche, the conservative German company which built its reputation as a builder of top quality sports cars since 1950, rocked the automotive establishment – including many ardent Porsche enthusiasts – when Ferry Porsche, son of the founder, announced, in 1989, that the company was going to develop an SUV. The automotive world was rocked again in 2002 when Porsche unveiled the first generation of its Cayenne SUV and it proved to be a refined and very capable addition to the range of these fashionable, versatile models offered by established brands. It was an instant, sure-fire, top seller for the company which many thought had taken a wild gamble in going down the SUV route. This “toe-in-the water” model was followed by an even more successful second-generation iteration in 2010, which sold 500 000 units compared to 270 000 examples of the first generation. Since its ground-breaking launch in 2002, the Cayenne has become a major contributor to global Porsche sales, together with its smaller Macan sibling. Last year Porsche global sales reached a record total of 246 000 units (4% up on the 2016 figure), which is apparently seen as an optimum volume for the current model line-up to maintain the brand’s badge of exclusivity. Porsche has now released the third series of its popular Cayenne large SUV. A range of three petrol-engined models will only arrive in South Africa in June, but the good news is that the prices of the even more advanced and better equipped 2018 models remain very competitive. The top model Cayenne Turbo will nudge over the R2m mark in a market where top-end derivatives in some of the opposition’s ranges are now into the R3m+ range. Newcomers such as the Lamborghini Urus and Rolls-Royce Cullinan will obviously be even higher priced. Porsche is obviously jealously guarding its patch in the SUV segment in the face of the onslaught from its rivals in the premium, niche categories of the global passenger car market. The company is, therefore, currently involved in rolling out media events for the latest Cayenne worldwide. 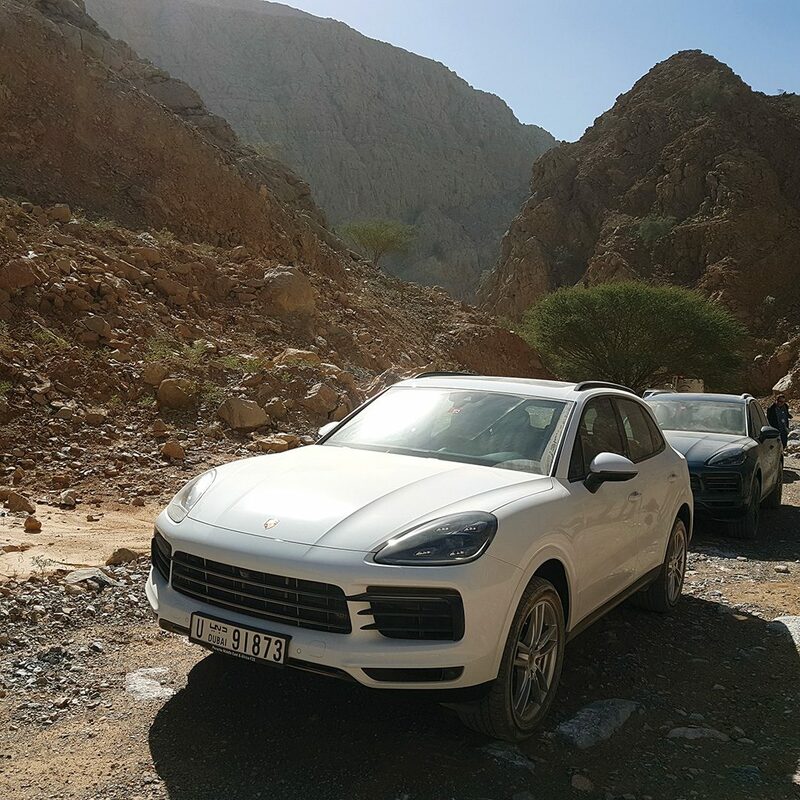 I recently attended the media launch for journalists from the Middle East and Africa in the UAE emirate of Fujairah and we were able to put the latest incarnation of the Cayenne through its paces on tar roads and off-road. The latter section of the route involved traversing rocky tracks and washaways in Wadi Bih (Oman) and Wadi Wurayah (Fujairah) on our way to a lunch venue perched spectacularly on the edge of a soaring cliff above a crescent of sandy beach on the Gulf of Oman. The scenery in this area, dominated by the towering Hajar mountain range of craggy cliffs ravaged by centuries of erosion by wind and water, is most imposing while also being desolate with the only inhabitants being the odd goat clambering over the rocks. This was certainly not the type of terrain where one would have seen a Porsche before the turn of the century! The latest generation of the Cayenne – the third – is a further example of the way in which Porsche evolves its models rather than drastically redesigning them. The new model is unmistakeably a Cayenne. The car is bigger and more spacious – including 100 litres more room in the luggage compartment – despite the styling being sleeker. However, under the skin there are major technical changes as well as significant upgrades in terms of equipment levels for comfort, safety, and convenience. As one expects in a vehicle of the calibre of the latest Porsche Cayenne, the fit-and-finish and level of materials used in the trim are beyond reproach and exhibit beautiful craftmanship in a restrained cabin design. As usual, there are a host of options on a long list which permits the potential buyer to specify the Cayenne to suit his or her personal taste, whether it is in terms of performance, safety, or appearance features. Of course, these options do not come cheaply and can add substantially to the purchase price if you select top specification items.